Where did this story come from? Who wrote it? How did it come to its odd underground prominence? How much do we know about its origins? How the hell do you pronounce Grignr? 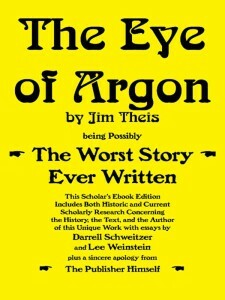 In this special Scholars’ Ebook Edition of THE EYE OF ARGON we learn all there is to know, and then some. In “One Fine Day in the Stygian Haunts of Hell,” Darrell Schweitzer recounts his own encounters with THE EYE OF ARGON in the 1980s and 1990s, and unsnarls the first tendrils of myth and folklore surrounding it. Then we go “In Search of Jim Theis” with Lee Weinstein as he puts on his Sherlock Holmes hat and tracks the story back to its murky origins, and its author. Finally, Roger MacBride Allen offers his own “Drippingly Sincere Apology and Bonus Obsessive Analysis,” uncovering the deep hidden meaning of everything, down to and including the staple holes in the original publication from whence sprang THE EYE OF ARGON. 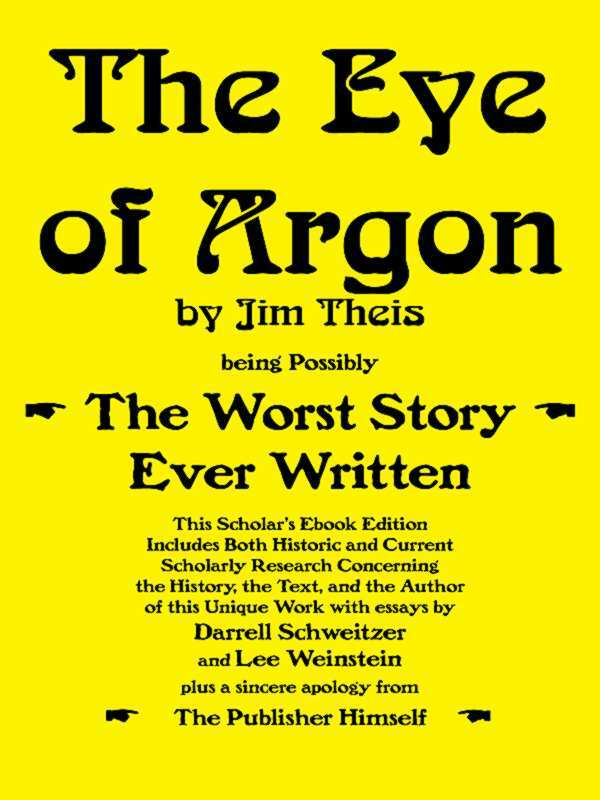 And, oh, yeah — this special Ebook Scholar’s Edition of THE EYE OF ARGON also includes the full text of the story, with newly uncovered bonus typos.